who's the fob now? : May 9; drinking buckets on a lesson planning weeknight. May 9; drinking buckets on a lesson planning weeknight. Kris and I went to La Bamba's to do a bit to lesson plan for the rest of the week. potato spudsters, as i learned, was just potato balls in batter. 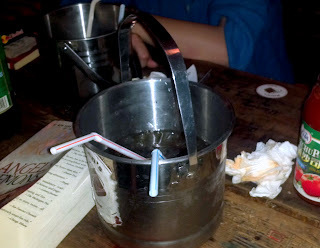 One of the usual bars we go to, Wu, had wonderful Wednesday special: free drinks from 8:00pm 'till late. When we arrived, they changed the special: open bar for 20 RMB for ladies and 50 RMB for men. Although it was a fantastic sounding deal, we found another place since we didn't feel like drinking on this lovely Wednesday night. We spent the rest of the evening at Helen's, one of my favourite student hangouts, with Tanjin plus papa John and David. Fact: Our dysfunctional family tree just got bigger! David was inducted into our family.